At least 107 people died and more than 230 people were injured when a crane collapsed in the Muslim holy city of Mecca in Saudi Arabia. The huge red crane crashed into a part of the Grand Mosque - the largest in the world - that was filled with worshippers at the time. The head of Saudi Arabia's civil defence said strong winds and heavy rains had caused the collapse. 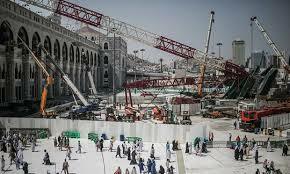 Mecca is currently preparing for the annual Muslim Hajj pilgrimage.